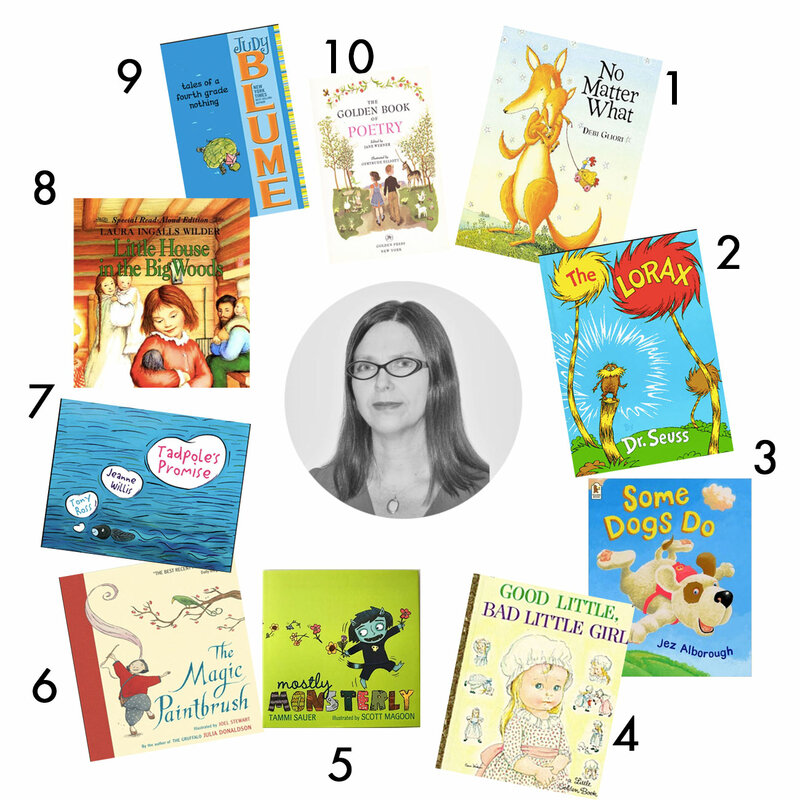 I’m so excited to share a new top ten list of children’s books from the author of the super fun story, There was a Wee Lassie who Swallowed a Midgie, Rebecca Colby. It’s is a mix of cherished books from both Rebecca’s childhood and her adult years. I truly love this book! I love it so much that I bought three copies—one for of each of my daughters, and one for myself. It is a touching story about a mother fox reassuring her cub that her love for him is unconditional and will last forever. It gives a comforting message, and no matter how many times I read this book, it never fails to bring tears to my eyes. As I child, my family couldn’t afford books. I remember taking this one out from the library over and over and over and…(well, you get the picture). I even hid it under bed at one point so I wouldn’t have to return it. At the time, I loved it for the nonsense words and fun rhymes. As an adult, I now enjoy it for the wit and satirical poke at environmental issues that we should all be concerned about—the destruction of our forests and natural resources. Can dogs fly? Some dogs don’t, but some dogs do. This book is best summed up with one of my favourite quotes, by Henry Ford: “Whether you think you can or you can’t—you’re right.” The impossible can often be possible, but much of our success in making miracles happen is down to our attitude and beliefs. I choose to dream big and believe! “There was a little girl, who had a little curl, right in the middle of her forehead. And when she was good, she was very, very good. But when she was bad, she was horrid.” This book is based on the above poem by Henry Wadsworth Longfellow. The Wilkin Sisters extended the original poem and made it into a book. I couldn’t exactly relate to the bad little girl as a child as bad behaviour wasn’t well-tolerated in my family, but I did find her behaviour fascinating, if not shocking. Having had children of my own, I think perhaps I wasn’t always the little angel I remember being, but reflecting on the behaviours of the two little girls at that age, who were, in fact, the same little girl, at least helped me strive to be good as much as possible. Bernadette may look like an ordinary monster, but underneath the fangs and claws, she has a secret: she likes kittens and flowers and cupcakes. When she starts school, she doesn’t fit in and must find a way to win over her classmates while remaining true to herself. The author does a great job of tackling the theme of individuality and acceptance without hitting the reader over the head with a heavy-handed message. It’s a humorous and entertaining book that is monsterly fun to read, while letting children know that it’s okay to be themselves. When a tadpole and a caterpillar meet, they fall in love. “I love everything about you,” says the caterpillar. “Promise you’ll never change.” But although tadpole promises not to change, he doesn’t realise what nature has in store for him and it proves to be a promise he can’t keep. In my opinion, this book breaks the mould for its unexpected and unconventional, unhappy ending. Having said that, despite the unhappy ending, kids still love this book–if only because it takes them by surprise. Ah, the romance of by-gone days in this real-life adventure story of pioneer girl, Laura Ingalls Wilder! I was captivated by how different life was just over 100 years before I first read this book. When I shared it with my own daughters for the first time, they were equally captivated and had lots of questions about life on the American frontier in the 19th century. At their instigation, we made corn meal pudding—a dish that is mentioned in the book more than once. In fourth grade, my teacher read this book to our class. We were enraptured by Peter’s tales of his little brother, Fudge, who threw tantrums, smeared mashed potatoes on the wall, and who even swallowed Peter’s turtle. This was one mischievous little boy! Fudge’s antics had us falling off our chairs with laughter, while sympathising with Peter’s frustrations, and hanging onto our teacher’s every word so we didn’t miss a beat of the story. Ogden Nash, Eugene Field, Edward Lear and James Whitcomb Riley, among others.